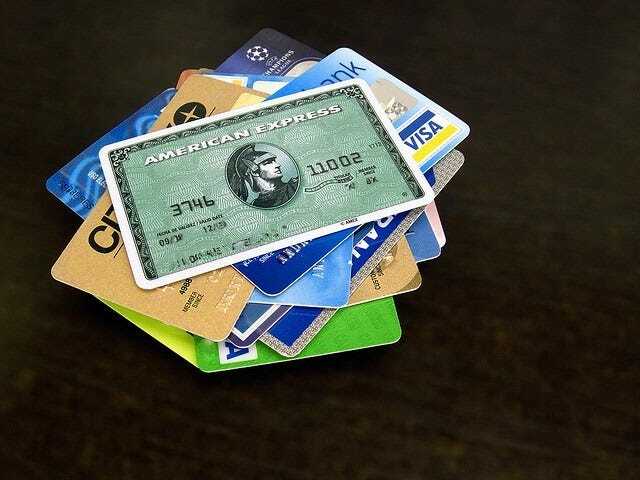 Banks, libraries, and points programs have the annoying habit of making you dig out your card to find the magic number that will let you log in to their web interface. Rather than make the ten foot walk to get your wallet, use LastPass to store all those number at once, securely. 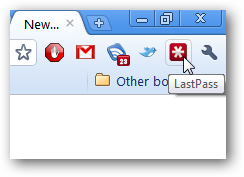 LastPass is a great way to store your passwords securely, and is one of the only password managers that works seamlessly with Google Chrome. 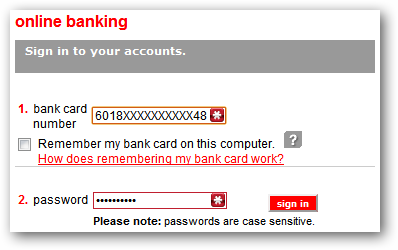 Once you’ve logged into one of those services that requires a card number, it should remember it no problem. However, if you’ve chosen not to auto-fill, or if this is the first time you’re accessing a website, you might be greeted with a screen like this one. Even if you’re not lazy, there is a significant psychological hurdle to overcome when a website asks you to fetch your wallet and enter a number that you’ll never bother to memorize. In the past, we’ve missed paying bills on time because the web interface required the card number, and we kept telling ourselves that we’d do it later when our wallet was more accessible. At the same time, we’re not comfortable storing card numbers in text files or in our email. Fortunately, LastPass offers the ability to store secure notes. 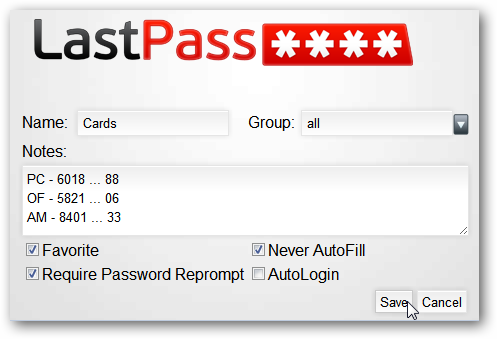 Put all of your card numbers in a secure note, and then the only thing you have to remember is your LastPass master password, which you know already! Note: these steps are shown using the Google Chrome LastPass extension. Steps for other browsers, or using the website directly, will be very similar. 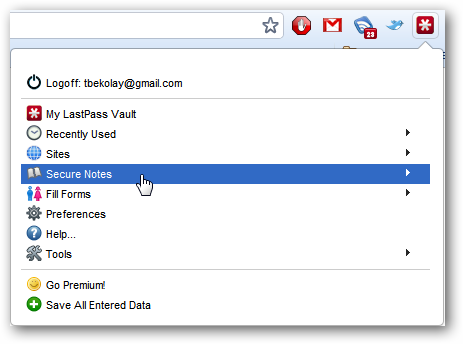 To create a secure note, click on the LastPass icon in the top-right of the screen. Click on the Secure Notes link. Click on Add Secure Note. This will open a tab to enter the secure note. There are a few things that we recommend when writing your note. Prefix each number with an identifier that you will remember, but a thief could not decipher. For example, if it’s a Bank of America number, use BA, or something more personal, like the name of that cute bank teller. Require a password reprompt, in case someone gains physical access to your computer. Consider adopting a simple obfuscation scheme in case the note is compromised. For example, if the card number is 16 digits long, list the last 8 digits before the first 8. Use the same scheme for each card number so that you don’t forget! Now, whenever you need to log into your bank or other service that uses your card number, just click on the LastPass icon, and click Secure Notes. You should see the note you created. Enter your password, if you chose to be re-prompted, and then you have your card numbers in just a few clicks! Much better than getting up and digging out your wallet.